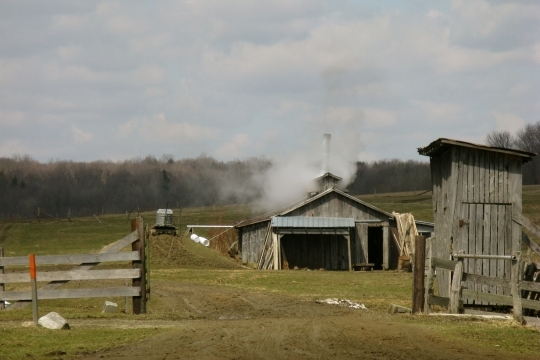 Tom continues his New York Amish coverage with some photos of an Amish maple syrup operation in the Randolph, NY area (Conewango Valley Amish community). A couple days ago Richard introduced the “art of canning”. Maple syrup has always seemed to have something of an art about it. So how about an ode to sugaring season? 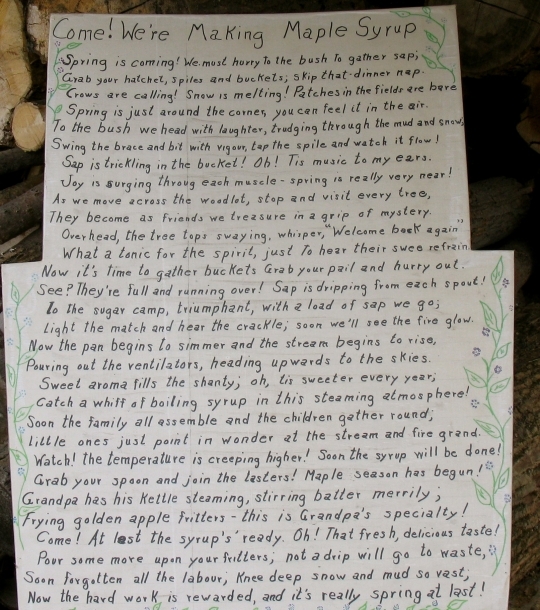 Tom says he is not sure who wrote this poem, but believe’s it is his friend’s wife’s work. I’m pretty experienced at pouring maple syrup on my pancakes, but not at making it. Anyone ever made it? Oh, yes, we sure did make it. My father used to compete with my maternal grandfather for the lightest syrup from the first run. You might call it a bit unusual to use maple syrup (of the darker variety for making pickled beets, but my mother did. I still make them that way, except I have to pay a lot more for the syrup! Most of the time we used maple syrup for what it was intended… pancakes or french toast. And we sometimes made popcorn balls as a treat. We were never without it. Okay, maybe we ran out a few times, just weeks before sugaring season started. Sugaring and maple syrup bring back sweet memories for me. Spring is coming! We must hurry to the bush to gather sap. Grab your hatchet, spiles and buckets; skip that dinner nap. Crows are calling! Snow is melting! Patches in the field are bare. Spring is just around the corner, you can feel it in the air. To the bush we head with laughter, trudging through the mud and snow. Swing the brace and bit with vigor, tap the spile and watch it flow! Sap is trickling in the bucket! Oh! Tis music to my ears. Joy is surging through each muscle spring is really very near! As we move across the woodlot, stop and visit every tree. They become as friends we treasure in a grip of mystery. What a tonic for the spirit, just to hear their sweet refrain. Now it’s time to gather buckets grab your pail and hurry out. See! They’re full and running over! Sap is dripping from each spout! To the sugar camp, triumphant, with a load of sap we go. Light the match and hear the crackle; soon we’ll see the fire glow. Now the pan begins to simmer and the steam begins to rise. Pouring out the ventilators, heading upward to the skies. Catch a whiff of boiling syrup in this steaming atmosphere. Soon the family all assemble and the children gather round. Little ones just point in wonder at the steam and fire grand. Watch! The temperature is creeping higher! Soon the syrup will be done! Grab your spoon and join the tasters! Frying golden apple fritters, this is grandpa’s specialty! Oh that fresh, delicious taste! Pour some more upon your fritters, not a drop will go to waste. Soon forgotten all the labor, knee deep in snow and mud so vast. Now the hard work is rewarded, and it’s really spring at last! I’m so enjoying your posts, Saloma. They add so much to the pictures this site creates for us because you lived “among them”. I’m sure there are things you miss. The pictures are wonderful too! How I wish we were close enough to visit where the activity. I am copying the poem to send to my granddaughter who is a very good writer at 12 yrs. That one could be published as I can feel the joy through the verse. I am one woman who would love to spend more time in the kitchen … and the garden. Unusual uses? Maybe…I have put it on ice cream and oatmeal and used it in place of other sugars in recipes, including pecan pie, popcorn balls and most recently English Toffee. A little bit of maple syrup adds a new dimension to spicy dishes such as red beans or barbecue sauce. And yes, maple syrup is a must for apple fritters. That was a wonderful poem! Makes me want to slosh through some mud in pursuit of a sweet treasure. In the county where I live, the conservation district (we’re very into purchasing/conserving what space is left) does maple tree tapping, boiling, the works, as a demo every year. I’ve never attended, but I think my kids did when they were younger, via school field trips. Growing up in Chicago, Mom (a maple lover) bought “Mapleine” (sp? )extract, adding it to cooked sugar/water and made “homemade” syrup that way. I still buy Mapleine, but use it in baking and cooking hot cereal (oatmeal, cream of wheat). We had a small maple tree in our yard a few years back (we had planted it about 5 years prior) and one late winter day, I noticed it “weeping” through a crack in the bark. The tree was already under stress (dropped its leaves early) and died the following year. I had hopes I’d be able to tap it someday, but mother nature had other plans, I guess. I loved that “epic” poem! 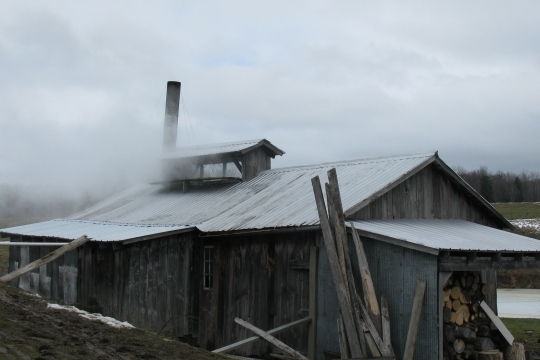 That, and viewing the photos of the sugar shack in operation, I could almost smell the aroma of maple syrup…m-m-m-m-m! I’m craving pancakes (not a good thing for a diabetic!). Alice Mary, My Mom did the same as yours with mapleline. We always had homemade syrup for our pancakes or waffles that way. I use maple in my baked beans and it taste better. I miss the maple harvest from Wisconsin. 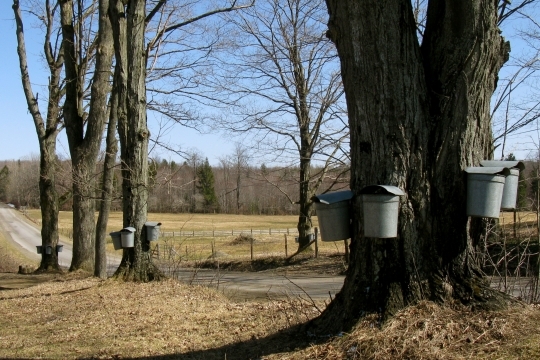 Used to go to the park and watch them harvest the sap and we could take containers to get some maple syrup to take home. With you being a diabetic use Agave syrup. Simular and better for you. Use it to replace sugar in most recipes. Another "art form" that i hope continues! I happened to have pancakes for breakfast this morning (coincidence). I used the artificial syrup though. I even think it was “Lite”. I remember two things about “sugaring” very well. First, not realizing that the sap that ran from the tree wasn’t good AT ALL, and second that all that sap didn’t make very much syrup. We had to keep the fire going all night and New York in the winter isn’t very nice weather. We’ve switched to real maple syrup for pancakes now that there are just two of us. Couldn’t afford it when we had all of the children at home! Tapped two weeks early here in VT, not sure what to make of this winter. Have had some good years sugaring with no snow on the ground though, time will tell. Goodness gracious! I lived in Randolph many years ago! 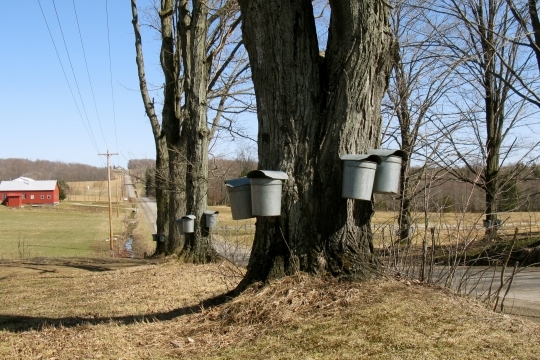 I now live in the Finger Lakes Region and last year, I tapped a few maples near the house and made up about a gallon and a half of syrup. One of my very favorite things to do with my syrup is to make barbeque sauce. I use a recipe that is a bit spicy, and the syrup adds a sweetness that throws it over the edge! I have recently discovered my ancestors who came here from Germany were Mennonites. I have always been interested in the Amish and Mennonite lifestyles, and perhaps now I know why! I have just discovered this site and am so happy I did! Yep Eli, biting the bullet here 😉 Actually we never ate much of the real kind growing up, so I am kind of used to the more artificial version. I could do without the “Lite” though it didn’t taste as “Lite” as I thought it would. 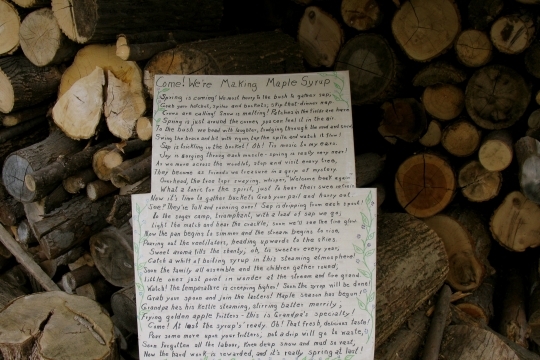 make lots of maple syrup. I am so fortunate to live not far from Orange County, Indiana where there are lots of Old Order Amish and Swartzentruber Amish who make maple syrup and sell it from their farms. The price is very reasonable compared to what you pay for it in town at one of the stores. 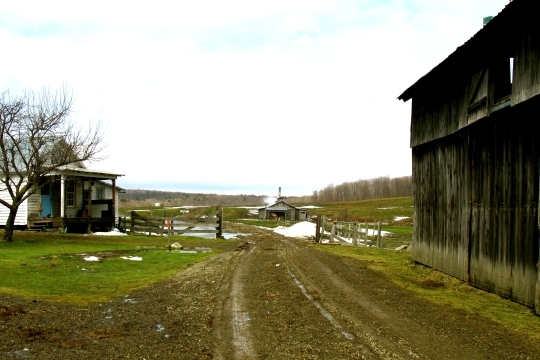 For a few years, I was on a tangent to try to find the best Amish-made maple syrup in Orange County. I think I found it — and it was at an Amish farm that had no sign out “Syrup for Sale”. An Amish friend “Amos” told me to “go down the road and see if “Joe” might have some syrup”. When I drove in the driveway, “Joe” came out and acted like he didn’t know what I was talking about in terms of syrup for sale, until I told him that his friend “Amos” had told me to stop by. Then “Joe” gladly sold me two quarts of syrup and invited me to come back when I needed more. Another example of the great informal network amongst Amish people, that sometimes they will let their English friends be part of. If you go to the Conewango settlement all the bake shops make maple syrup glazed donuts..could teach Dunkin and Tim Horton a thing or two. When I was in elementary school maple syrup season was one of my favorites because of the field trip to a local park that produced maple syrup. Of course the trips always involved more than just the process, it provided a nice winter time nature hike and got us out of conventional classes. Everyone bought maple syrup / sugar cookies (apparently almost pure maple syrup/sugar rather a person liked it or not.